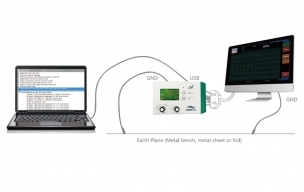 The CMRR tester combining accuracy,convenience and test automation all together. Compliant with IEC 60601-2-25, IEC 60601-2-27, IEC 60601-2-47, IEC 60601-2-26, YY1079, YY1139, YY0782, YY0885, ANSI / AAMI EC11, ANSI/AAMI EC13. 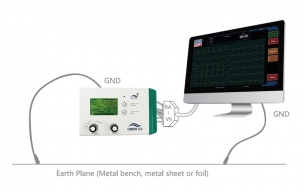 Designed for ECG, Patient Monitor, Holter and EEG CMRR and system noise testing. Double shielding structure to avoid internal and external noise interference. Built-in calibrated sine wave generator and Vc voltage measuring circuit to assure output accuracy level. Adjustable knobs to select test standards and test parameters in standalone usage. CMRR Assistant software pack to simplify the standard into adjustable parameters and selectable options. Software Development Kit (SDK) allows user to develop customized automatic test software with less efforts. 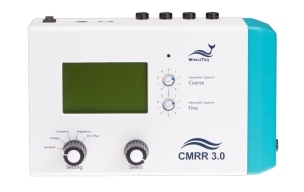 CMRR 3.0 Advanced Common mode rejection ratio tester with 11 compound terminals. CMRR Assistant-IEC Auto setup for CMRR tests of IEC60601-2-25/-27/-47 and EC11/13 standards. CMRR Assistant-E26 Auto setup for CMRR tests of IEC60601-2-26. CMRR Assistant-YY Auto setup for YY0782/YY0885/YY1079/YY1139 CMRR tests. ACM008-01 CMRR 3.0 External case (30x20x13cm) for better shielding performance with ECG DUT.